Laura who does educational fundraising met Jeff, a consultant through mutual friends. Laura and Jeff had a classic Cape Cod wedding. 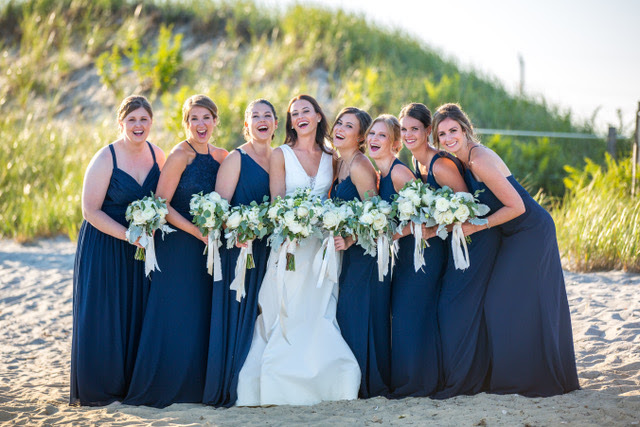 The bridesmaids wore navy dresses and carried beautiful white bouquets. The couple added their personal touch through the hand drawn map that was on their invitations. The map showed the location where they became engaged along with the ceremony location and the reception site, the West Dennis Yacht Club. In preparation of a fun time, the wedding favors were “hangover kits” with all the fixings for Bloody Marys on Sunday morning!